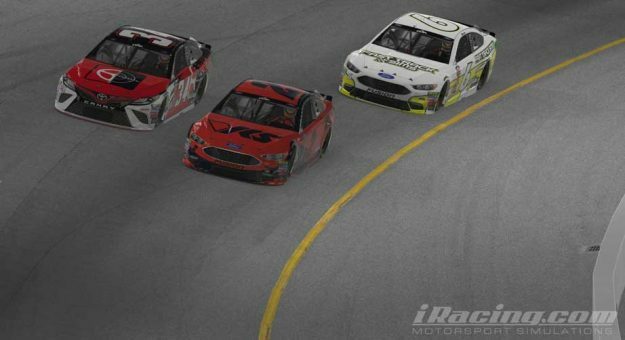 Ray Alfalla scored his first win of the 2018 PEAK Antifreeze NASCAR iRacing Series season, surviving a poor qualifying effort and the chaos on the track at Richmond Raceway. Alfalla started 25th and with 15 cautions slowing the field had plenty of wrecks to dodge on his way to the victory. Polesitter Ryan Luza fell one spot short of a third straight win after leading 76 of 200 laps. Keegan Leahy was third, Matt Bussa finished fourth, and Christian Challiner came home fifth. Luza led the first 20 circuits before losing the lead to Dylan Duval, who chose to stay out under caution. Duval could not keep the lead for long as Luza motored by Duval as he made contact with Bobby Zalenski on Lap 24. Luza again went unchallenged up front until Lap 42, where a pit stop cost Luza the lead. This time, Leahy won the battle off pit road and managed to stay in front of Luza for a few laps before slipping back. Problems in the pits continued for Luza on Lap 85 as he lost three spots. Reclaiming the top spot would not be so easy this time. On the Lap 88 restart, Leahy led Alfalla with Michael Conti sliding into third after contact with Nick Ottinger. The trio’s battle culminated with Conti passing Alfalla for the lead on Lap 98 and setting sail, opening up a nearly two-second margin before his lead was erased on Lap 125 when Brian Schoenburg was spun around by Chris Overland. Conti would keep the lead on that round of pit stops but another caution led to a split strategy on Lap 137 with Conti choosing to pit but 17 other lead-lap cars opting to remain on track, including Luza who inherited the lead. Conti would never recover the track position and finished 10th. Meanwhile, Luza had his hands full with Matt Bussa at the front with Bussa muscling into the lead on the restart. After a few more cautions, Alfalla joined the fray as well, as it appeared the race would come down to a battle between the new front three. Alfalla made his move on the restart with 12 laps to go, taking just one lap to move past Luza and set his sights on Bussa for the race lead. Bussa made a valiant effort but Alfalla prevailed with seven laps to go. Luza had worked his way past Bussa as well but a caution with four laps to go ended the race under the yellow flag before Luza had a chance to mount one last charge. Alfalla’s victory slightly extended his NASCAR PEAK Antifreeze iRacing Series championship lead. He leads Luza by six points after five races. Leahy is third, 27 points back, followed by Zalenski, who is 35 points adrift. Conti is fifth, only two points behind Zalenski. With Richmond in the rear-view, three downforce-heavy race tracks are up next on the schedule, starting with Kansas Speedway, which will wrap up the first third of the 2018 season. With Alfalla and Luza threatening to make it a two-man battle for the championship, the question is, can anyone else keep pace? Perhaps it is Leahy, who already has a win this year, or could it be 2014 champion Conti who has looked stronger of late? Whoever hopes to rise to the challenge will have their work cut out — the top two look nearly unbeatable right now. However, with 13 races still to go, anything can happen.